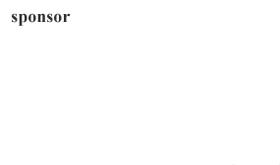 As I write this, there is an excessive heat warning in Cincinnati, with heat index values reaching 102 degrees. NOAA, the National Oceanic and Atmospheric Administration has just reported that June temperatures marked 14 consecutive months of record-breaking heat across the globe, with the average sea surface temperature also reaching a record high. One thing is clear, as the hottest part of the summer approaches, inside is the place to be. And of all places, one to consider is the Dayton Art Institute, where its current exhibition, The Antarctic Sublime & The Elements of Nature: Water, will put you in a cooler frame of mind. The exhibition is the second in a series of three consecutive exhibitions that focus on natural elements. Last spring was Into the Ether: Contemporary Light Artists, and this fall will be Ravaged Sublime: Landscape Photography in the 21st Century. The Antarctic Sublime & The Elements of Nature: Water is a small, intimate exhibit, consisting of just three works, each installed in a separate room. teamLab, Universe of Water Particles, 2013, 5 channel digital work, Continuous Loop, No. 58607.EC2. Image courtesy the artist. Universe of Water Particles, a 10-foot high digital waterfall, was created by teamLab, an “ultratechnologist” contemporary Japanese artists’ collective. Conceived as “the materiality of water as a continuum of particles that flow in accordance with the laws of physics”, as the wall label explains, this piece is rendered in over five times the resolution of HD. It consists of five vertically stacked digital panels glowing with tiny moving dots and lines (actually light trails of the dots) that appear to flow down a vaguely implied cliff form. Hints of cyan and blue, along with digital mist rising and floating away from the falling “particles”, contribute to the feeling of movement in the piece. Dramatically displayed at the far end of darkened gallery, the viewer is drawn increasingly closer. The movement of the dots is on a continuous loop, and the pace of the movement is slow enough to still the mind as a long, attentive gaze tracks a line here, a puff of mist there, seeking the point of repetition. The visualization of water as lines of energy is repeated at the other end of the gallery in a dimly lit suite of three Edo-period Japanese ukiyo-e woodblock prints (courtesy of the DAI collection) depicting waterfall scenes. Images like these were the original inspiration for teamLab’s exploration of water as their artist-ancestors Hokusai, Hiroshige, and others, might have perceived it. Visitors view the photograph Periton Moreno #18 by Frank Thiel. Image courtesy of the Dayton Art Institute. Perito Moreno #18 is Berlin-based artist Frank Thiel’s thirteen-foot wide photograph of the Perito Moreno glacier in Argentina. The photograph at once presents an enveloping view in a scale that is monumental for a photograph, but in actuality reduces the 18 mile long by 3 mile wide glacier to miniature. In this state its grandeur is conceivable, the sublime contained – our eyes and brain can take it all in at once. The image of nature’s awe-inspiring beauty, ironically, for all its size, takes on a preciousness. Thiel’s photograph is presented in extremely high definition, and rewards time taken to look closely. Reminiscent of the iconic water tower and blast furnace images of Bernd and Hilla Becher, the lighting in Thiel’s image is very flat: the sky is a uniform backdrop of white, and the face of the glacier is in open shade, without deep shadows that would obscure vision into the fissures penetrating the mass. Instead, we can see the subtlest variations in the color of the ice, differences in form and texture where the sun meets the uppermost surfaces, horizontal bands marking the glacier’s formation, and vertical cracks that indicate inherent tension. An adjacent piece of wall text includes a 2015 photograph of Perito Moreno by Jennelle Marcereau that shows an elevated perspective of the glacier, giving viewers a different notion of the enormity of its mass. The context in which Thiel’s photograph is presented refers to a famed exhibition of Frederic Church’s 1861 painting “The Icebergs” revealed in a room as a single, nearly ten-foot long painting, behind a crimson curtain. This installation also contains a speaker that produces rumbling sounds of parts of the iceberg breaking and falling into the water, a process referred to as “calving”. Daniel Rozin, Penguins Mirror, 2015, 450 stuffed animals, motors, control electronics, Xbox Kinect, Mac mini, custom software, tin bases, Dimensions variable, Edition AP of 1, 1 AP. Courtesy bitforms gallery, New York, photo by John Berens. 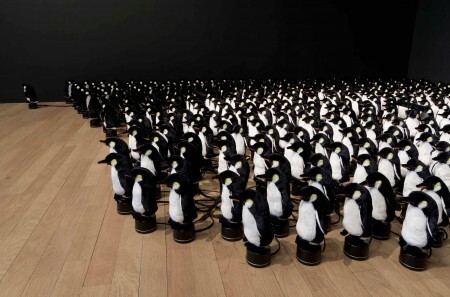 Penguins Mirror by Daniel Rozin is an interactive installation of 450 stuffed toy penguins. The penguins spin around to reveal either black backs or white bellies in response to a viewer’s movement across the field of an X-box Kinect motion sensor, or in the event that nobody is moving in the room, revert to an algorhythmic pattern of spinning and stopping. Rozin’s Snow Mirror and Brushed Metal Mirror were featured in the previous Into the Ether exhibition. Penguin Mirror is a lighthearted work, fun to play with. The technology is visible and audible, so viewers can see what mechanisms make the piece move in response to light. The gentle zooms and clicks that the rotating devices emit as the penguins spin make for a pleasing soundtrack. The Antarctic Sublime & The Elements of Nature: Water is a refreshing a break from the heat and a welcome opportunity to see significant works of contemporary art displayed among the notable collections of the Dayton Art Institute. The DAI’s element- themed exhibits thus far have featured work of pioneering artists exploring technological innovation as well as traditional genres depicted in contemporary terms. It is a trend I hope they continue, and I look forward to seeing the final exhibition in the series.